MANILA, 10 November 2016: Leading real estate website Lamudi Philippines has included a number of seminars to its upcoming Housing Fair, scheduled to happen November 18 to 20 at the Megatrade Hall 3 of SM Megamall in Mandaluyong. The lectures are to be conducted by a number of experts in local real estate, mostly touching on homebuying and investment. 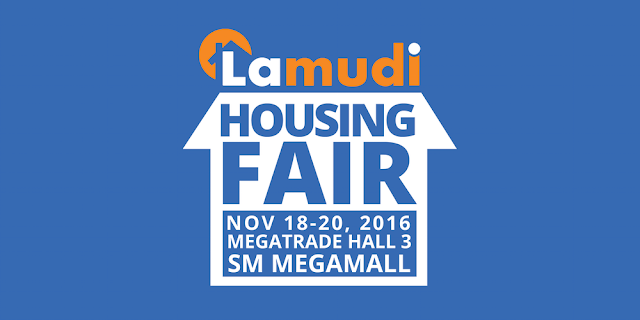 In a continued effort to empower Filipino homebuyers with the largest inventory of local listings in the country and comprehensive real estate tips and information, Lamudi Philippines is offering attendees of the Housing Fair the opportunity to learn about home buying and investment at no cost. Discussing topics under the real estate investing and selling front, among others, are Property Forum Founder Noli Alleje, who will discuss growth market opportunities especially in the foreclosures market, Philippine Property Expert CEO Joanne Almaden, who will speak about pre-selling condos, and Lamudi Philippines’ CEO and founder Jacqueline van den Ende, who will share her experience and expertise regarding selling properties online. Parties with a particular interest in homebuying, on the other hand, can attend the talks to be facilitated by Colliers International Philippines Research Manager Joey Bondoc, who will discuss the Philippines’ present property outlook, Greenhuts Realty Owner and licensed real estate broker and appraiser Genevieve Bonquin, who will discuss the ins and outs of the homebuying process, Pinnacle Real Estate Consulting Services Director for Research & Consulting Director for Research & Consulting Jojo Romarx Salas, who will expound on the differences between buying and renting. These are but a few of the speakers expected to grace the event, with other also slated to touch on other homebuying and investment topics, and sponsor presentations from the likes of Hoppler and Infinite Edge Modern homes also scheduled for the Housing Fair. The Lamudi Housing Fair is set to be the largest housing event in the Philippines, and will feature the widest selection of properties and offer exclusive discounts to homebuyers and property investors. Visitors may also take advantage of great deals for real estate foreclosure property auction with partner banks and brokerages at the Housing Fair. Parties interested in going to any or all of the seminars simply have to register online, and can already attend free of charge. Other fun games, promos and activities will also be available for the whole family and exciting prizes awaits the first 100 attendees to register at the Lamudi Housing Fair Booth.